The project aims to involve a growing number of small and medium enterprises (SMEs) in apprenticeships. After identifying SMEs’ needs, the project will train 26 apprenticeship coaches in Chambers of Commerce and develop a toolbox. This will help apprenticeship coaches, in-company trainers and Chambers to support SMEs wishing to host an apprentice and raise awareness on the benefits of apprenticeships among EU citizens. 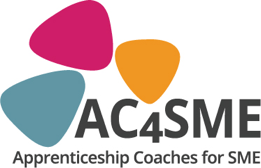 AC4SME is co-financed by the Erasmus + Programme of the EU. The project runs in 12 countries, under the coordination of EUROCHAMBRES, the Association of European Chambers of Commerce and Industry.